Congratulations to Irene and her team for competing in the Wakaama Raglan competition 9th & 10th May 2015! A cold, foggy start but great event in the beautiful scenic harbour of Raglan. 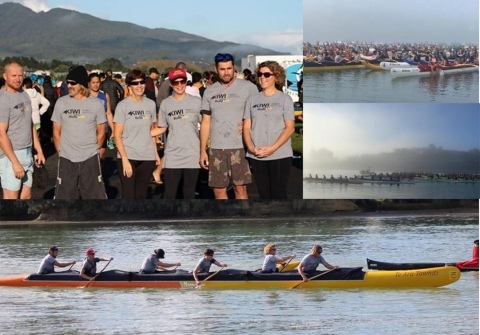 More than 800 paddlers raced across in the Raglan habour during the Whaingaroa Hoe - the biggest event on the waka ama calendar bar the National Championships. T Shirts proudly sponsored by Kiwi Timber Supplies.